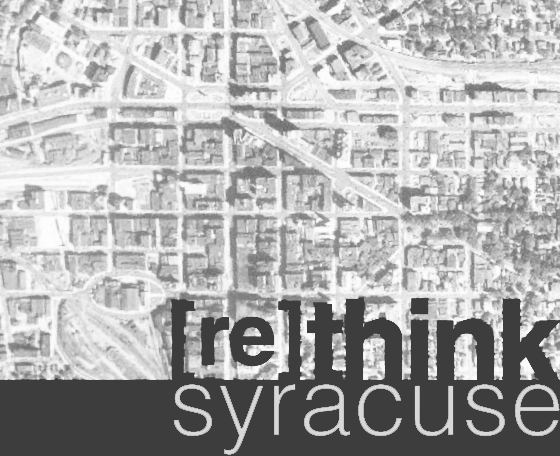 The newest issue of Syracuse Magazine is out, and with that issue comes a re-imagining of the Salina Street corridor as it traverses the entire city. More extensive information is to come, but for now, read below for the excerpt from the magazine. 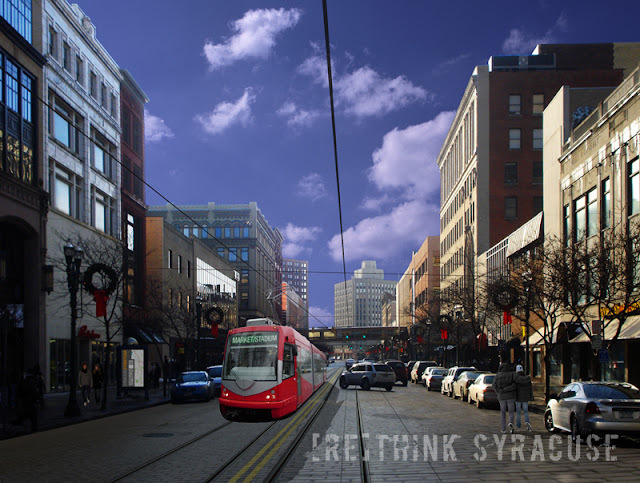 Salina Street, Syracuse’s original main street, remains densely lined with commercial, retail, residential, cultural, institutional, and recreational spaces, yet much of it is currently vacant or underutilized. Although much of the street sits in an alarming state of disrepair and disinvestment, its rich architecture is largely intact, enticing us with its potential. A major catalyst in realizing this potential could be a streetcar line that runs the length of the street from one end of the city to the other. Unlike the now-prevalent city bus, streetcars are proven in cities like Portland and Charlotte to encourage pedestrian activity and development along their routes, as they provide an unchanging route and consistent, smooth service. • Better access to food by connecting Green Hills Grocery at the south end and the Regional Market at the north. • The densest shopping districts downtown and along North Salina would be connected and easily accessible to residents and tourists alike. • Increased connectivity among existing transportation systems such as the Connective Corridor, the Regional Transportation Center and the new CENTRO bus hub. • A less isolated baseball stadium, accessible from downtown or home without needing to drive; during the day, the stadium lots could be used as a park-and-ride for employees working downtown. • An increase in value of property, and an increase in residential and commercial demand adjacent to the line. A streetcar line is by no means the silver bullet for reinvestment along Salina Street, but it is an effective revitalization tool in other cities and can certainly give our main street a strong push in the right direction. This issue of Syracuse Magazine can be picked up at Wegmans, as well as at many of your favorite news stands.